The ACCESS delegation’s visit to Akshardam was an excellent finale to our sightseeing around Delhi. Akshardam is a major temple complex constructed by the Swaminarayan sect of Hinduism, and is the largest Hindu temple in the world. It was truly a sight to behold! 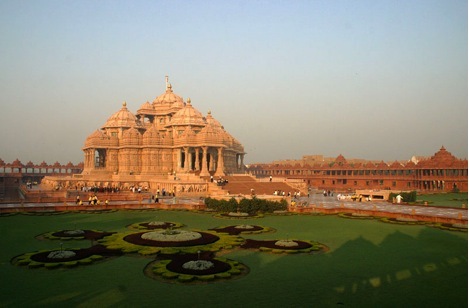 Built entirely of pink sandstone using traditional building methods, the seven thousand stone carvers who worked on the project not only worked their full day’s shift of carving, but also volunteered many additional hours each day in order to complete the monumental undertaking in only four years. According to one of our guides, the intent was to build a temple complex that would stand for centuries, along the lines of what we saw at Qutb Minar earlier in the day. The temple complex has an IMAX theater, apparently the only one in India, which shows a movie about the odyssey of Nilkanth, a boy who left his home village and traveled throughout India to learn about its people and spread his Hindu teachings and spirituality. Our group also took a boat ride through a museum that imparted amazing lessons about the history of India and its people. I learned many amazing facts about India on this ride, including the fact that India is home to the world’s first university and that Indians apparently discovered or developed many scientific principles decades or centuries before Western scientists. After our group experienced many of the tourist wonders at Akshardam, including musical dancing fountains and the beautiful, massive stonecarvings, we met with one of the Hindu Sadhus in residence at Akshardam. We had a lengthy discussion about his spiritual journey and he shared some of the teachings of the head of the sect that built the complex. It was during this conversation that we also delved into the striking similarities between modern Hinduism and modern Judaism. 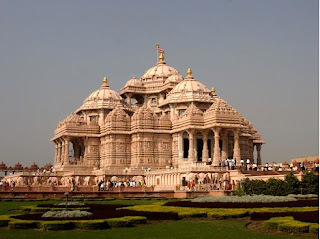 One reason Akshardam was created and incorporates things like a historical boat ride and an IMAX theater is that many younger Hindus have lost connection with the traditions of Hinduism, in much the same way that younger Jews do not follow many of the traditional aspects of Judaism. Intermarriage, modernization, and assimilation necessitated the incorporation of these modern entertainment venues in order to connect with younger people that are more interested in technology than texts. Akshardam had an impact as an amazing tourist destination as well as an insight into the historical underpinnings and current state of one of the world’s major religions.